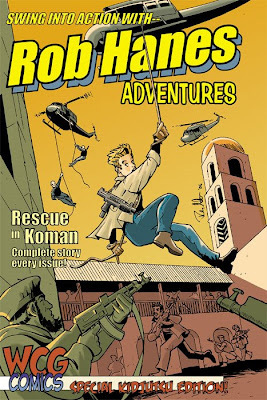 As part of my plan to give the series as broad exposure as possible, Rob Hanes Adventures can now be found at Kidjutsu, a new comics website where the featured comics are presented in a family-friendly, age-appropriate manner. 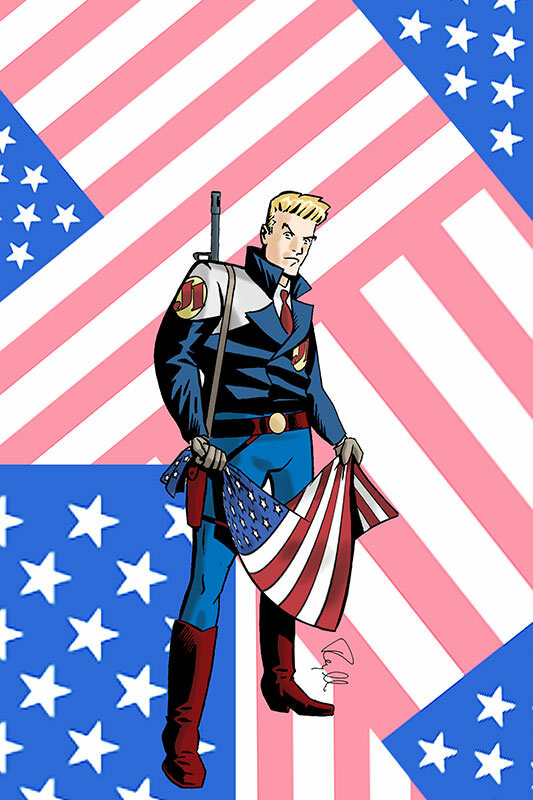 Go here to see the main page for the series at the site. Show your support for the series by checking out the series at the site! I'd be remiss if I were not to note that today is David Naughton's birthday, known for An American Werewolf in London, the Dr. Pepper commercials and, of course, the TV show, "Makin' It." As mentioned in a previous post, I recently upgraded my home computer system from a 10-year-old Win98 PC to a new 20" iMac. The transition has been amazingly easy, especially when one considers that I have Windows XP running within the Mac operating system so that I could continue using some old Windows software and hardware on the new computer that either don't exist for the Mac or would be a waste of money to re-purchase a Mac version. The only piece of equipment I had to replace as a result of this transition was a graphics tablet—replacing a 4"x5" Aiptek HyperPen 5000 drawing tablet that I've also had for about 10 years but which featured an obsolete PC serial connection. 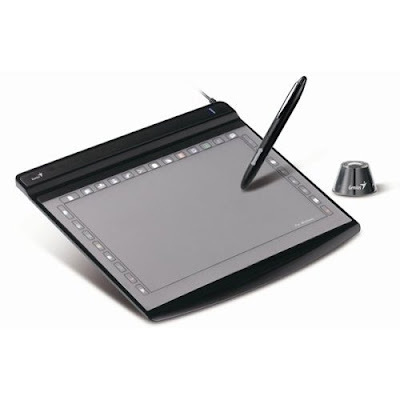 Being the model of thrift I am, I initially had planned to purchase a small Wacom Bamboo drawing tablet, priced under $100 (Wacom is the gold standard for computer graphics tablets). Fortunately, before I made the purchase, after doing a little research and scrutinizing more closely the tablet's specs, I realized the tablet, while within my price range (under $100) was, with its 5.8"x3.7" active drawing space, smaller than even my old tablet and probably way too small for my needs, especially given the fact that I now have a wider-screen monitor. I then looked at the medium-sized Wacom Bamboo, which with a 8.5"x5.3" live area seemed a bit more suitable. But priced at $199, I must admit it was a bit steep. I conducted additional research (thank goodness for Google! ), and began to focus on the Genius G-Pen F610 tablet. Not only did the tablet feature a much roomier 6"x10" live drawing area, it was also priced just under $100 on Amazon! There were some negative user reviews of the tablet, but fortunately I've learned to sometimes take such comments with a grain of salt, especially when taken as a whole with other comments and reviews. What also finally drove my decision was the realization that the Wacom tablet that actually was more comparable to the F610 wasn't the medium-sized Wacom Bamboo, but the Wacom Intuos3, which sold for $299! Given this, I thought it worth it to take the risk with the G-Pen. However, now that I'm using it, I cancertainly see that the larger tablet is much more conducive to drawing. Up until now, I primarily limited my tablet "drawing" with minor digital touch ups on my art after it had been scanned in. With the larger, roomier drawing space, I can project myself using the drawing function a little more, though at this point not exclusively. Initially, when I first connected the tablet, I did experience a "lag" with the pen, which some user reviews had complained about. In fact, the pen dragged quite significantly, usually causing a very ragged line very different than what I had drawn. The instruction manual also was very minimal and useless, which others had noted. You can imagine I was aghast at this development. So my new system is now fully decked out for me to do post work on my comics pages! Though I haven't delved deeply into the genre, I know there are many cinefiles who are connoisseurs of Bollywood films—Hindi musicals from India. They are usually quite big spectacles featuring catchy Hindi pop songs, over-the-top and elaborate dance numbers, and quite beautiful actors and actresses. Because of their energy and exuberance, as well as their reputation of being wonderful examples of pure, innocent escapism, they've been often compared to classic Hollywood musicals, reminiscent of Busby Berkeley musicals. While I was aware of them, what seriously piqued my interest in the genre was a number from the 1966 Bollywood movie Gumnaam that was featured in the 2001 film Ghost World, an adaptation of cartoonist Dan Clowes' respected graphic novel of the same name. The DVD release featured the number in its entirety, which I have linked to below. It's a great time capsule for the worldwide go-go '60s phenomenon. The second clip is from a film called Kabhi Khushi Kabhie Gham that came to my attention during, of all places, a comedy bit on the Colbert Report television show, where they featured a brief excerpt from the number linked below. The brief bit they showed wowed me, but understandably I didn't catch the title. A few weeks later, however, out of sheer dumb luck, I stumbled across the DVD of the film n my local public library!! After watching all the numbers several times (and playing them for my family), I did try to follow the story—but I must admit it was a bit inpenetrable and didn't hold my interest much. But the musical numbers are worth the price of admission on their own. In recent years, due to the growing respect and attention that Bollywood stars and their films have received internationally (partly the result of the growing influence of expatriate Indian populations in the U.S. and Britain, and other places around the world), some of these stars have been performing in concerts in Southern California. Note: For a better quality clip of the video below, or if it's no longer available, go here. Some of the better quality clips of this number have been taken down or are not allowed to be embedded.